So what is ‘3 Days To Kill‘? It’s a big fat silly cliche of a movie. But it’s mostly fun if you don’t pay attention to ridiculous story plot or stereotypes that are on screen. Last year and this year is a big time for actor Kevin Costner. He has played a few supporting roles as of recently, which were excellent, especially in ‘Man of Steel‘ as Pa Kent. Then we saw him in the new ‘Jack Ryan‘ film, which was great as well. Now, he is a leading man once again, and back to his glory days as a likable yet badass type of guy. We’ve missed you Costner, and we’re glad to have you back. And if this is a sign of what’s to come, it will only get better from here. ‘3 Days To Kill‘ is co-written by Luc Besson of ‘The Fifth Element‘ and ‘Leon The Professional‘ fame. His name even appears in the opening credits above a taxi, which is a throwback to one of his earlier projects. But Besson and McG didn’t want to make straight out shoot-em-up thriller. No, they wanted to make three movies in one, all of which never make any sense. They mixed a spy thriller with a silly slapstick comedy, and a coming-of-age film into two long hours without really molding a good story into it. 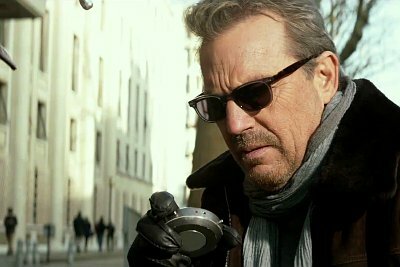 Costner plays Ethan Renner, who is essentially a hit-man for a government agency. He even left his wife Christine (Connie Nielsen) and daughter Zoey (Hailee Steinfeld) to travel the world and take out bad guys, which he is extremely good at. When a job goes wrong, Ethan finds out he has a few months left to live, due to brain cancer. So he moves back to Paris, where his wife and daughter are now living to patch things up and spend his remaining days with them. They reluctantly accept him back on the condition that he not work for the government anymore. So all is well in the Renner household, right? Wrong. Vivi Delay (Amber Heard) shows up, always in some sort of exotic leather outfit with different hair colors to coax back Ethan in for one more job. Ethan declines, but Vivi offers him an experimental drug to cure him. He accepts the offer even though it has some crippling side-effects, which can be instantly and easily cured by drinking shots of vodka. With Ethan’s wife gone for a few days on a business trip, he has a few days to kill with his daughter to catch up on lost time with her. And so the film plays out in segments with 20 minutes here and there of Ethan teaching his teenage daughter how to ride a bicycle, taking her for ice cream, and swinging on a swing set, not to mention the long talks of where he’s been for the past twelve years. When we’re not watching Costner play a father figure, we catch him killing the bad guys, who seem to all have scars and accents. Amber Heard’s character is straight out of a Russian spy thriller movie, but only seems to show up for a few minutes during the film and never really goes anywhere. The same can be said for a family of squatters occupying Ethan’s home. None of it really makes sense. However, one of the best scenes in the film is when Ethan ties up The Guido to a toilet and is about to torture him when his daughter calls his cell phone and asks for a recipe for spaghetti sauce, to which Ethan forces a frightened Guido to deliver his mother’s Italian recipe over the phone. This is the type of stuff that we’re dealing with in ‘3 Days To Kill‘. The bad guys are ripped straight out of an 80s pro-American action film. Richard Sammel plays The Wolf and is as stereotypical as they come. You might recognize Sammel from Quentin Tarantino’s ‘Inglorious Basterds‘ as the German nazi soldier who got his brains bashed in by the Bear Jew. The dialogue has cheese poured all over it, but the action sequences are very well executed, despite its PG-13 rating. Costner is excellent in this as is Steinfeld and Nielsen. But Costner just carries the film as you just want to hang out with the guy on a weekly basis. Is this worth seeing in the theater? Probably not, but it’s a solid movie to watch when it comes out on Netflix. This entry was posted on Thursday, February 20th, 2014 at 12:18 pm	and is filed under Film, News. You can follow any responses to this entry through the RSS 2.0 feed. You can skip to the end and leave a response. Pinging is currently not allowed. « Terrence Howard Set To Star In ‘Empire’! !